Since opening our virtual doors I’ve “met” a lot of talented modelers and just plane ole’ good folks through Model Paint Solutions. 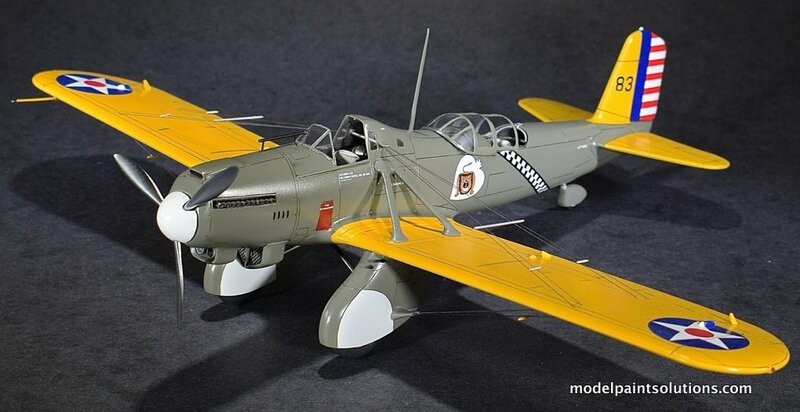 I receive calls and emails from modelers all over the world with airbrush and/or modeling-related questions. Providing answers and assistance to modelers with paint and airbrushing problems is one of the cornerstones of MPS and one that we take seriously. The cause of most airbrushing issues can usually be traced back to improper paint dilution and/or unsuitable air pressures combined with the inevitable problems caused by dirty airbrush syndrome. That last one is a real issue for a lot of guys but there are easy answers to all of these problems. We appreciate the investment that a quality airbrush represents. If you’re new to airbrushing we can match you with a brush that is appropriate for your level and intended applications. If you’re experienced with an airbrush and want to move into fine-line work, we’ve got multiple options that provide fine-line performance at a reasonable cost. Most importantly, after you get your airbrush, we’ll assist you in getting it “dialed in” to your satisfaction. This service may include emails, telephone conversations, Face Time, or Skype: whatever works best for you. Our work starts after you get the brush. The comments below were submitted by previous MPS customers. My sincere thanks to you all for your time and kind words. It is rare to find a service level like what I experienced with John at MPS. I can recommend MPS to anyone looking to improve their skills or purchase quality airbrush-related items. The bar is instantly raised when you work with John. I have continued to purchase paint and other items from MPS and I can honestly say that John works hard to ensure that the transaction is as smooth a process as possible. If I ever need to purchase another airbrush or any other airbrushing supplies, I will definitely utilize Model Paint solutions. I had just received for Christmas an H&S Infinity and was having a very difficult time using the brush correctly, so much so that I was ready to give up on it. I watched all of the YouTube videos and still couldn’t figure out what I was doing wrong. Then, to complicate matters, the brush suddenly stopped working all together. Through a search I came across MPS and reached out to John as a last resort. My email was quickly responded to with an invitation to speak over the phone. Without any hesitation, John at MPS offered to take a look at my brush and report back the issues. The next day, the brush was on its way from Illinois to Washington State. Upon arrival, John quickly diagnosed the problem, provided a detailed plan of action to repair the brush, and within a week, it was back on my bench in perfect working order. But the service did not end with the repair of the brush. John made sure to check in once the brush was back home. He continued to provide support and knowledge that I could rely on and helped improve my airbrushing skills. I have used several of his recommended techniques and I have not been disappointed. John is well versed in the area of airbrushing, and has a fantastic set of resources on the MPS website. I can honestly say that if it weren’t for John and MPS, I wouldn’t have learned how to properly use my airbrush to maximum effect. I’ve been a customer of Model Paint Solutions since shorty after they started selling the Mission Models line of acrylic paint. Not only does Model Paint Solutions sell high quality airbrushing tools and paints, they also provide superior customer service that includes a willingness to answer detailed painting and airbrush questions. For those who live in the greater Seattle, Washington area, John Miller, Model Paint Solutions proprietor, holds frequent airbrushing seminars at the Skyway Model Shop in Renton. His blog on airbrushing is also an essential airbrushing and painting reference. When friends and coworkers ask me about painting and airbrushing, I send them to Model Paint Solutions and I plan on remaining a customer for many years to come. I have been model building and airbrushing for over 50 years. I am not an artist! I currently own eight airbrushes. Many modelers tell me that all double action internal mix airbrushes are about the same. I would have agreed until I purchased the Infinity from H&S. This airbrush is a whole level above the competition in quality of construction, design, feel, and control. And for a double action, cleaning seems easier. I am so enamored with this airbrush, I admit to only using it on special projects! What an airbrush! I have found John at Model Paint Solutions to provide customer service at a much higher level than the competition. The amount of time John spent helping me was simply incredible. No question regarding the airbrush, paints, or airbrushing was too inane for John’s speedy and informed response. I deeply appreciated the personalized attention! I would highly recommend Model Paint Solutions. I was referred to Model Paint Solutions by Jon Tamkin of Mission Models after he suggested an H&S Infinity airbrush. I was not really satisfied with my other airbrushes, and wanted something better. John Miller at Model Paint Solutions helped me to decide on the H&S. This was the best decision I ever made. The airbrush is fantastic, and is now my go-to airbrush. John was tremendously helpful. I would highly recommend Model Paint Solutions, not just for the great products and great prices, but also for the exceptional service and knowledge that John provides. It’s great experience with John and Model Paint Solutions. I’ve been using hand brush painting for years. Until one day, in a model shop’s demo event, I saw John’s demonstrating airbrushing and the new paint colors. I was astonished about his skill and knowledge. I asked him a lot of questions about taking myself to a new level of converting to airbrushing, and he responded very patiently. He’s such a nice person. I totally trust him. He helped me pick the airbrush and pump that fits my level and good for the next couple of years use. At first, I don’t have much knowledge about airbrushing. But after talk with him, I just would like to trust him and do whatever this experienced guy told me to do. lol. Now six months passed, it proved my decision was totally right. The airbrush and compressor he introduced to me are totally wonderful choice. I feel more and more love in them. After I got my airbrush, John invited me to his shop and trained me how to use them, step-by-step practice. I learned a lot from how to use the thinner, to how to 345 (three soaks for five minutes each) to clean an airbrush. I really appreciate that great afternoon. Now, I’m using the airbrush he introduced to me, the skills he taught me, the suggestions he gave me all the time. I’ve made three model ships since then, I actively keep in touch with him about what I found and keep learning from him. He’s a great teacher, and great friend! Thanks again to all of our customers. If you have any questions about airbrushing, airbrushes, or modeling drop me a line at john@modelpaintsol.com or give us a call at (253) 642-7862. Model Paint Solutions provides the tools and supplies for handling, storing, spraying, and finishing model paints.